Deadpool Week: I'm swapping DNA, I think I'm swapping DNA, I really think so! So I seem to have exhausted scans of the old Deadpool run (except for bits and pieces which may be posted later), which means now we move on to the awesome Cable & Deadpool run. Cable & Deadpool was written almost entirely by Deadpool creator Fabian Nicieza, and is way fun. In the first story arc, Nicieza has to set up WHY two such unlikely partners (whacked-out merc and mutant savior of the world) end up together. And he does it. With style. To make a long story short, there's this virus called the Facade virus, and both Wade (Deadpool) and Nate (Cable) have been infected. The Facade virus is *supposed* to change everyone and make them blue, because the people using it (the One World Church) believe that making everyone the same color will somehow be the first step in stopping disagreement and fighting between people. Well, the virus *does* turn people blue, but unfortunately there's a pesky little side effect: it causes them to melt and die. (Ah, I love comics.) Since both Cable & Deadpool are not like ordinary people, it affects them a bit differently. 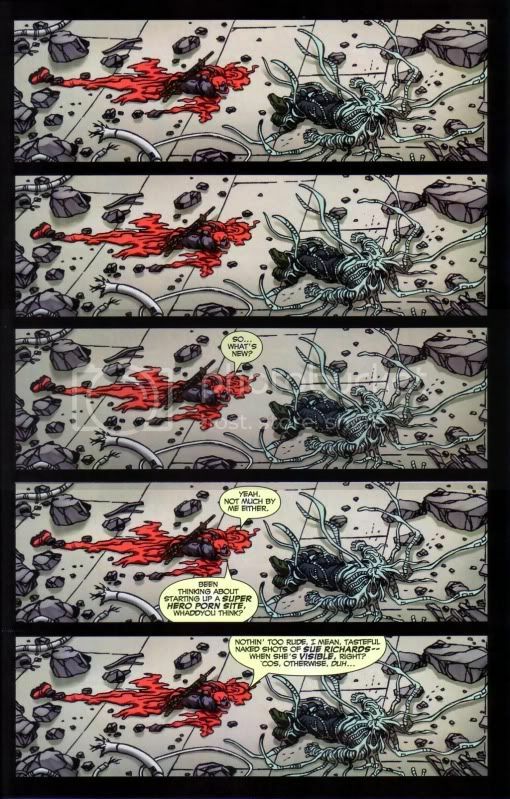 In Deadpool, it still causes him to melt, but a lot more slowly because of his persistent regenerative powers. 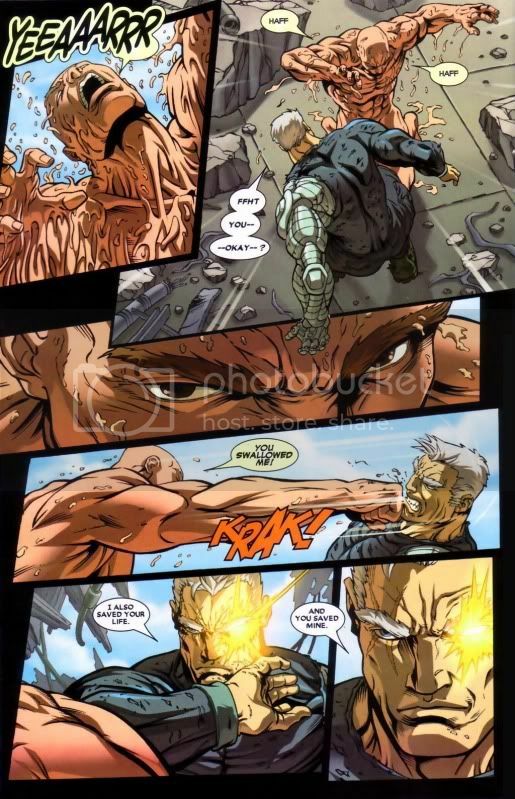 In Cable, it acts to block his telekinetic and telepathic abilities to control the techno-organic mesh that makes up part of his flesh, causing the T-O to start taking over his body and immobilizing him. Cable determines that the two have to swap DNA so they can pool their abilities in order to save themselves (yes, really). You know... that's really remarkably clever. I love it when someone can take a step back, look at what's really possible given the powersets on offer, and make something like this out of it. The artwork's well-done and imaginative, too. Nice. THIS IS WHY I LOVE THEM SO. Hee. Oh, me too. Good ol' Fabian. Hee. Yeah, but would it be a *tasteful* site? HEE. But being a Deadpool fangirl I won't complain about him staying all Shar Pei'd. "Charisma: It's not about your looks. It's about your AWESOME." Yeah, seriously. Where's our mostly!naked pretty merc closeup? At least we get the little shots of him putting on his uniform (icon). He is just so awesome, isn't he? Heh.